Terri Degenkolb of Whimsicals tells us, "I have always loved to sketch cats, and having grown up with as many as 15 barn cats at a time, it just seemed natural to make cats the basis for a fabric line. Remembering their silly antics, playing together or lounging on the highest perch they could get to, and then recapturing them by giving each one its own personality was so much fun. I came up with the name Purrsnickitty one afternoon while playing around with words typically associated with cats and came across "persnickety." Purr…..kitty…..Hmmm….. Purrsnickitty! It was perfect!" The fabric panel features 15 vignettes that highlight the many lives of cats. There are napping cats, proud cats, playful cats, mousers, fishers, and some very lucky birds in cages. A companion print names some favorite felines … Scaredy Cat, Prissy Cat, Naughty Kitty, Fat Cat, and Cool Cat, who sports sunglasses, a tie, and quite an attitude! 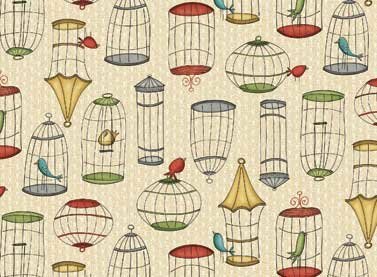 A toss of cats and birdcages, a text print, birdcages, polka dots, and a sweet floral complete this fun collection. Imagine the kitty vignettes centered in hexagons or nine patch squares in a quilt for a favorite kid or cat lover. Or, stitch up little girl's dresses, pinafores, and aprons, pillows, quillows, and totes - the possibilities are endless!